England striker Wayne Rooney said it would "not be the end of the world" to miss the World Cup finals. Rooney, who on Wednesday collected Manchester United's player of the year award on crutches, has broken at least two metatarsal bones in his right foot. The 20-year-old said: "Any player wants to play in the World Cup, but if it's not to be I'll have more tournaments. "I'm obviously disappointed to get injured when I have done but life goes on and hopefully I can get fit." The England team doctor is due to report on Rooney's foot injury on Thursday, with the World Cup just 37 days away. Rooney added: "I'm disappointed and everyone is disappointed for me, but I'm a strong lad and I've got support from everybody. "There's been a lot of stuff all over the TV and in the papers but you've got to blank that out. "It's nice that people care about you but you've got to concentrate on doing your work and getting yourself right. Sir Alex Ferguson insisted that Manchester United are keen for the striker to play in the finals in Germany. Ferguson distanced himself from reports that Rooney's injury would spark a club versus country rift over his availability. Ferguson said: "We want Wayne Rooney to play at the World Cup, there's no question of that. "It enhances the reputation of the football club and if he's going to be a star of the World Cup then we will reap the rewards from that. "We'll do our best to get the boy there, but I felt the wrong message was getting out about the possibility of him playing in the World Cup. "The thing we tried to do was dampen the enthusiasm a bit." 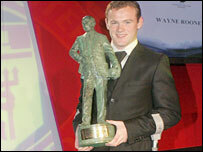 Rooney picked up the fans' player of the year award at United's inaugural awards dinner. Ryan Giggs got the vote for players' player of the year.